Grandchildren keep the "older folks" young, and those grandparents enrich the lives of the youngsters in many ways too! Capture the joy of family this year with the 9 grandkids - loving hearts at Christmas personalized ornament that will sparkle throughout the season from the tree or other favorite display location. These grandparents ornaments personalized from Russell Rhodes arrive with everyone's name and more added where shown to produce a custom keepsake that will be cherished for generations. 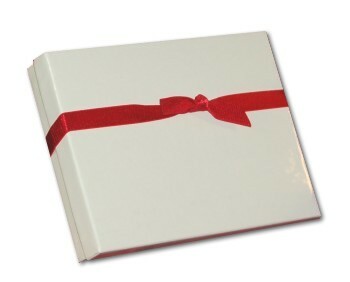 Give us the details, and an artist will add them by hand in letters more stylish than those shown. 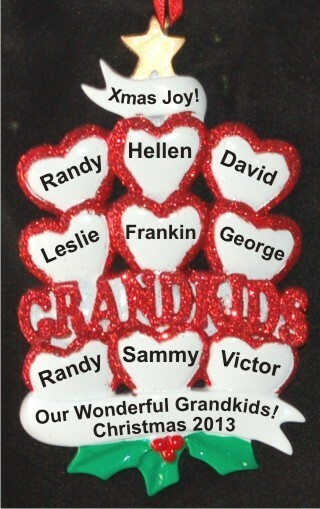 The bright, beautiful stacked hearts 9 grandchildren personalized Christmas ornament in our classic velvet gift bag will become an instant family favorite for all!